University Beat report on the renaming of the USF Zimmerman School of Advertising and Mass Communications and the issues that the new name raises. For the fourth time since last September, the University of South Florida has renamed one of its schools after receiving a gift of at least ten million dollars. But unlike the last three, this time it’s not a business school, but the School of Mass Communications that’s being "rebranded." 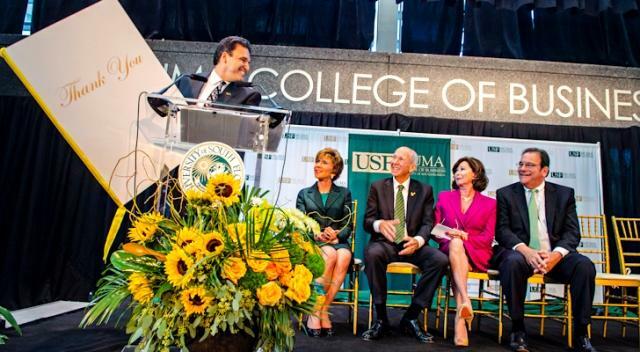 The new Zimmerman School of Advertising and Mass Communications is named after USF trustee, advertising executive Jordan Zimmerman, who in March donated $10 million to his alma mater. "There’s no better time than today to make the gift towards education, make the gift to give back to others, make the gift of forward education and make the gift to build the number one advertising communications school in the world," he said at a celebration outside the school. 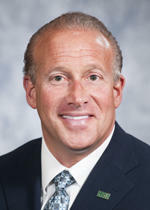 Zimmerman is the founder and chairman of Fort Lauderdale-based Zimmerman Advertising, the largest advertising agency in the southeast U.S. by billing. He helped create the “Just Say No” anti-drug slogan made famous in the 1980's while still a student at USF. His eponymous agency later created such campaigns as "better ingredients, better pizza" for Papa John's and "just show me the CARFAX." Zimmerman's been a longtime supporter of his alma mater. "This university gave me my start," Zimmerman said. "They inspired me. They educated me. They built my confidence." 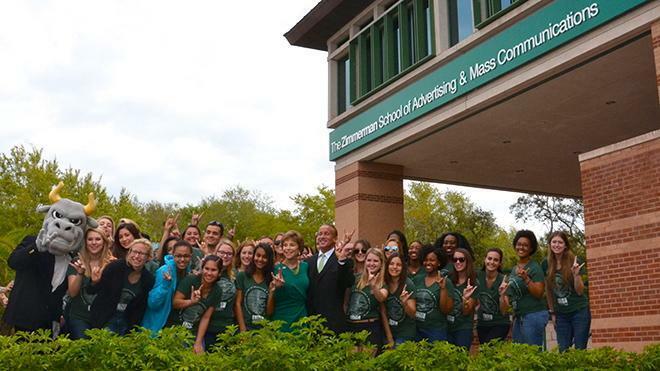 Ten years ago, a $1.4 million gift helped create the Zimmerman Advertising Program at USF, where advertising students live in the same residence hall while studying a curriculum that marries advertising and business. 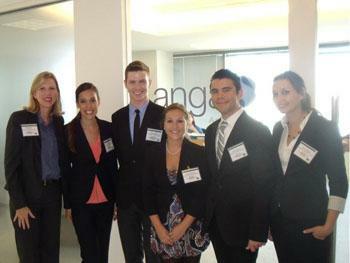 "About 12 percent of our graduates used to work in the advertising field," Zimmerman said. "Today over 72 percent work in the advertising field." But Zimmerman believes even that figure can be improved. "These students that are coming out today, I will not be satisfied until every single one of them gets a job offer the day they graduate and multiple job offers, at a premium price," Zimmerman said. Eric Eisenberg, dean of USF’s College of Arts and Sciences, calls Zimmerman’s donation a "transformative gift." He says it will help reshape the school’s other programs, like public relations and multimedia journalism and production. "What it allows us to do is almost completely retool our curriculum and the way in which we deliver our instruction. It also allows us to attract new faculty and world class faculty to offer our students a better experience," Eisenberg said. But Zimmerman’s gift also raises eyebrows. First, some from the traditional school of journalism, including people in our own newsroom, expressed concerns about "advertising" appearing so prominently in the name of a school that also teaches future reporters. Zimmerman’s reply? "Today when you report, news comes from the social sphere; it doesn’t come from the newsrooms any longer," Zimmerman said. "The newsrooms get it the same time the social world gets it, so if you think there’s church and state, ladies and gentlemen, church and state does not exist any longer." Kelly McBride, vice president for academic programs at St. Petersburg-based journalism school, the Poynter Institute, disagrees. "While advertising is growing, it can’t replace journalism – democracy needs independent journalism to flourish and thrive," McBride said. "There’s something to be said for preserving the core values of journalism and making sure that we have a media ecosystem that still has space for journalism; it’s just not going to be the biggest voice in the marketplace." 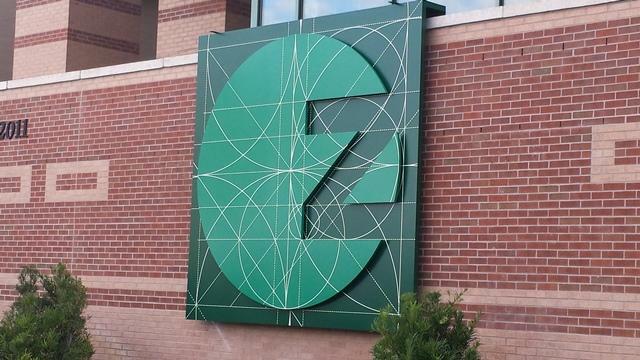 There’s also the question of the school's "brand" - for example, the big green "Z," similar to Zimmerman Advertising's logo, that now adorns the school's building. "Naming is the brass ring that you really want because we all really know that USF is an extraordinary school but the fact of the matter is, up until a few years ago, people around the country and around the world didn’t know who we were," Eisenberg said. "Having Zimmerman as a destination like a Wharton or these other kinds of ‘name schools’ that are out there really makes a difference," he said, adding "I said to someone earlier, it’s one thing to say, ‘Boy, I think we’re really going to have a great brand,’ it’s another thing if the world expert on branding says to you, ‘We’re going to have a great brand.’"
"I have never thought of it in that way because I know the individual is so passionate about education and this is his school, so it didn’t occur to me," she said. "There’s no nervousness that I have at all," she added with a laugh. So perhaps Kelly McBride of Poynter sums it up best: it’s not about the name of the school – it’s what that school teaches its students. "When you’re making a hire in media, you’re really looking at the skills that the person possesses. Some people have a great diploma with a legendary school on it, and some people have a school you’ve never heard of, and some people don’t even have a diploma," McBride pointed out. "And it’s really more about what the person can do – I don’t think anybody hires an individual because of the diploma first." Jordan Zimmerman will be honored later this month by being one of 12 business leaders added to the Horatio Alger Association of Distinguished Americans. It's yet another multimillion dollar donation and corresponding name change for a University of South Florida school. But this one's a little bit different. The amount of the donation -- $10 million -- is the same as two of the three previous gifts, and the giver is a USF graduate, also like two of the previous donors. This time, however, the recipient isn't a USF business school. WUSF University Beat report on the new Lynn Peppinger School of Accountancy. For the third time in six months, a University of South Florida business school is changing its name thanks to a multi-million dollar donation. 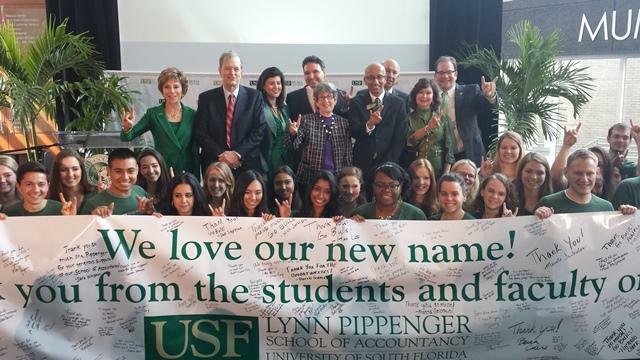 This time, it’s the USF Muma College of Business Lynn Pippenger School of Accountancy, which now bears the name of a retired Raymond James executive and USF graduate who recently gave $10 million to the school. Thanks to a superhero, USF’s Advanced Public Relations class returned home from Washington, D.C., with a second-place finish - and first-place prize money - after taking part in America's Natural Gas Alliance (ANGA) Collegiate Energy Challenge. WUSF's University Beat report on the USF Muma College of Business. In a five week period between early September and mid-October, the University of South Florida system saw its two Colleges of Business undergo monumental changes. While the USF Saint Petersburg Kate Tiedemann College of Business took a new name and broke ground on a new building - things we'll discuss on next week's University Beat - the College of Business on the Tampa campus also has a new name. 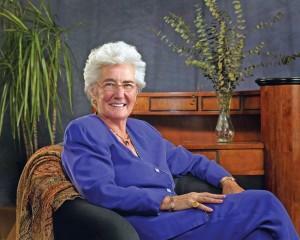 The University of South Florida St. Petersburg is naming its College of Business after a Pinellas County entrepreneur who came to America on a steamship and worked her way up to starting her own internationally-known company. The USF System Board of Trustees approved the new name - the USFSP Kate Tiedemann College of Business - at its meeting Thursday. 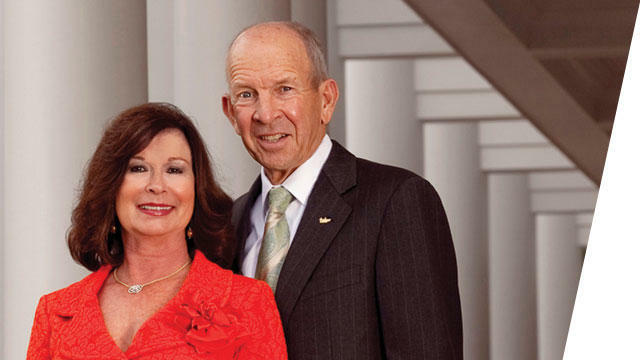 In what they call a "visible thank you" to the school that helped them become successful, local businessman Les Muma and his wife, Pam, have donated $25 million to the University of South Florida College of Business - the largest single gift in USF's history.